Isle Of Dogs is set 20 years in the future in the fictional Japanese metropolis of Megasaki City, where a dog-flu epidemic has infected all canine kind. This forces cat-loving Mayor Kobayashi (Kunichi Nomura) to execute an executive order that would remove all dogs from the city and displace them in the secluded Trash Island. It’s a desolate wasteland full of nothing but garbage. All of the furry inhabitants that live on the island are frail and on the verge of death. But there are five dogs who have survived the ordeal. Rex (Edward Norton), the de-facto leader; Boss (Bill Murray), the mascot for the Dragons; Duke (Jeff Goldblum), an incorrigible gossip; King (Bob Balaban), the dog who was the face of a doggy treat company; and Chief (Bryan Cranston), a disillusioned stray who doesn’t take kind of humans. All five work together as a pack to survive in their unpleasant surroundings. It is literally a dog eat dog world there as the five have to fight to survive against other dogs. That is until, a young boy, Atari Kobayashi (Koyu Rankin), falls from the sky and crash-lands on Trash Island. You see, Atari is desperately looking for his bodyguard dog, Spots (Liev Schreiber). But Atari is not just your ordinary young boy. He is an orphan adopted by his blood uncle Mayor Kobayashi, the very person who is at the forefront of the anti-dog movement. While it may look cute and has all of Anderson’s favorite signatures on the surface, there are a few problems that the film has regarding appropriation and representation. While Isle Of Dogs is set in Japan, the way the film goes about translating their language sounds quirky at first but is actually convoluted. In the film, Japanese is translated in a variety of ways. One will be told either through a news press conference interpreter (Francis McDormand), the other is electronic subtitles, and finally through Tracey Walker (Greta Gerwig), a foreign exchange student and school journalist who seems to understand Japanese but reciprocates in English. At times it’s hard to keep up with, and it would have been much simpler to go with just one. So it doesn’t make sense to set the film in Japan if the language is just going to be reduced to being talked over or simple phrases are just paired with emotional gestures. In regards to how Isle Of Dogs solves the issue of the talking dog, there is an opening that explains that all of the dogs’ barks would be translated immediately into English. That is more of a clever deception to cover up the blatant whitewashing. Despite there being notable Japanese actors and musicians having roles in the film, it still has white majority cast that overshadows them. Again, even though they are voicing dogs, they still get a more prominent role in the film than their Japanese supporting cast. So it’s a shame that Anderson wastes an opportunity to celebrate the language. Still, there are some things to look forward to. The visual storytelling is astounding. A lot of what we see is as if we were watching a stage play or better yet, Kabuki theatre. Panning shots allow the audience to move with the character from a single vantage point. It doesn’t matter if it is from left to right or up and down. The incredible detail that is in this film is pleasing to the eye. There are clear nods to great Japanese filmmakers like Akira Kurosawa. And the dichotomy between the well-developed city and Trash Isle shows the socio-economic problems. While Anderson’s usual style of filming is there, the director also never strays too far away from his wheelhouse. 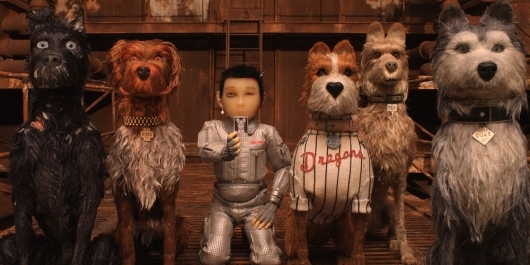 Isle Of Dogs be may quirky, witty, and full of deadpan humor, but it is also one of his most politically charged films. The parallels of immigration, the validity of journalism, and the misuse of political power are a clear reflection of the times we live in now. Dogs are criminalized for something that is beyond their control and forcibly removed from their domesticated life to Trash Island, a literal garbage dump – which is also reminiscent of the Halocaust. But all Anderson is doing is using those same wonderful Japanese aesthetics and beautiful culture and using its people as supporting players. It’s just Kubo all over again, but this time with a white savior. Yes, this film even has one of those. Not sure how many times a minority needs to have a white savior in their films. But this film has one. Walker is a foreign exchange student who works at the school paper who tries to uncover the truth behind the removal of these dogs and the sinister plan to eradicate them. She’s the one who tries to inspire an uprising against Mayor Kobayashi’s anti-dog rhetoric and propaganda. Not only that, but she goes to great lengths to investigate a coverup and the corruption within the government. So once again, the white savior comes to inspire the people to rise up with her and join her cause to save all the dogs from genocide. How many more times are we going to see this dated trope? Isn’t it about time that we give the minority the power to rise up on their own? I mean it’s nice that it did come from a female character, but I believe the message would have been stronger if it had been someone who was also a Japanese female. It would have also been great for the representation movement. But here we are, watching a culture forced to play a supportive role in their own homeland. Representation and appropriation problems aside, Isle Of Dogs also suffers from a slow burning second act that seems to go nowhere. It digs its heels in, failing to develop any of the characters or move the story along. There are characters and subplots that get more attention than they deserve and others that don’t get nearly enough attention. For example, Nutmeg (Scarlett Johansson), a pretty show dog who is subjected to Duke’s gossip, seems to be there for a love interest role but doesn’t do nearly enough to be of any interest. There is no denying that Isle Of Dogs is an animation achievement. Watching a stop-motion animated film address some serious political themes through Anderson’s lens was a nice surprise. But despite the director’s bold move, it repeats the same appropriation and white savior mistakes of the past and attempts to rectify them by paying their respects to a culture where the film is set, all the while turning its people into supporting players. It’s an interesting paradox. How much of Anderson’s film is paying homage and how much of it is just flat-out tone-deaf? It’s not as though the film is going out of its way to being culturally insensitive. Anderson does collaborate on the story with Kunichi Nomura and makes sure to be as respectful of the culture as much as possible. The aforementioned cultural aesthetics raise the production value of the film while also recognizing and honoring its Japanese surroundings. The biggest problem with Isle Of Dogs is how it goes about presenting the language to its audience. It’s either spoken over or whittled down to simple phrases, which marginalizes a culture and its people. But at the same time, you cannot take your eyes off its beauty. The film’s heart is in the right place, and it does try hard, but it is something that could have gone about things very differently. One that wouldn’t leave me in a place of angst and wonder.